Original equipment (OE) manufacturer and system supplier HELLA has launched its latest and most comprehensive universal lighting catalogue, which showcases not only the huge depth of its range, but underlines the company’s enormous sector specialism. 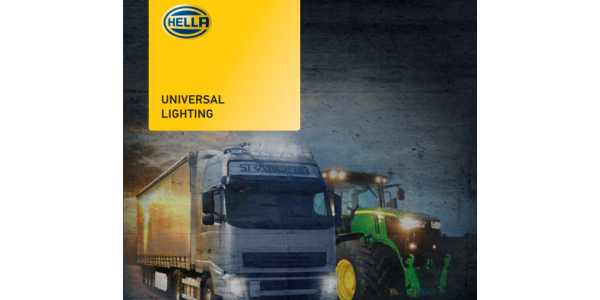 Covering everything from front and rear lights, auxiliary driving and marker lights, as well as beacons and work/reversing lights, the 98-page publication is the ultimate guide to universal lighting, providing readers with the only reference tool they need to identify the ideal solution. Particularly in the heavy-duty sector, whether for on or off-road use, both replacement and auxiliary lighting must be able to withstand the prevailing conditions of the environment and therefore prove durable, in addition to being reliable. HELLA work lights are a great case in point as effective illumination of the working area during the hours of darkness is vital not only for the safe keeping of those carrying out the undertaking and road users in the vicinity, but to ensure maximum productivity. Highlighting its ability to provide the most robust and innovative solutions, the CoroSafe, NonoSafe and Compact Series work light ranges adopt differing strategies to combat corrosion, thus providing operators with the solution that really fulfils the application’s requirements, rather than something that is, at best, a compromise. In addition to their powerful illumination, HELLA’s work lights also have ECE R23 approval, which means for maximum convenience, they are able to double as a reversing light. Due to the quality of light produced by light emitting diodes (LED), which causes less fatigue to the human eye, LED work lights greatly improve the environment for operatives. However, they can sometimes glare other road users, which is why HELLA developed ZEROGLARE. This innovation, which specifically aims the LED light onto the area in front of the vehicle, creating a very clear cut-off line, ensures that drivers of oncoming vehicles won’t be blinded and increases the level of safety for all concerned. In addition to the range specific information it contains, the catalogue naturally includes product dimensions, illumination patterns and output, as well as all the relevant part numbers for straightforward application referencing. For added convenience, it also incorporates QR codes to enable users to access greater, model specific details, on their smart phone.